My mother loved lobster. For Mother's Day we would pick her up from her apartment and drive to Little Saigon to Dong Khanh a restaurant an hour south of Los Angeles. With our cousins and sons, we would order a dozen dishes and eagerly turn the lazy Susan in the center of the large table so we could sample all the dishes. My mother's favorite was the salt and pepper stir fried lobster. 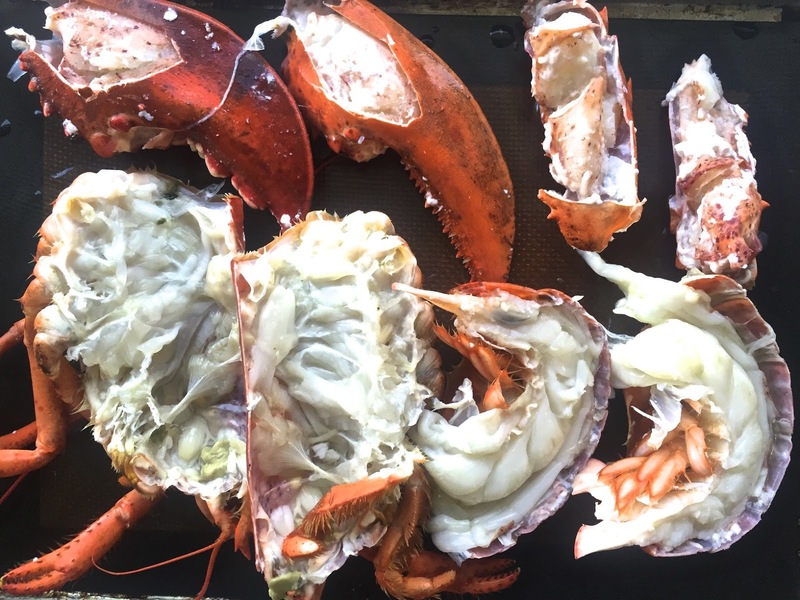 Picked from the salt water tank, the lobster would be paraded to the table for our approval, then it was walked to the small kitchen in back to be transformed into that wonderful dish. Cooked in the shell, eating the lobster took a lot of work. But the sauce was so fragrant and tasty, we didn't mind. And mother, always a gnawer of bones, would gleefully take her time, making certain she enjoyed every last drop of sauce and all the tender sweet lobster meat. It's difficult to think that my mom passed away ten years ago. She seems very much alive in my memory. Unfortunately, Dong Khan closed this year. So, life as we all know, moves on. For this Mother's Day, we will grill chicken and steaks. 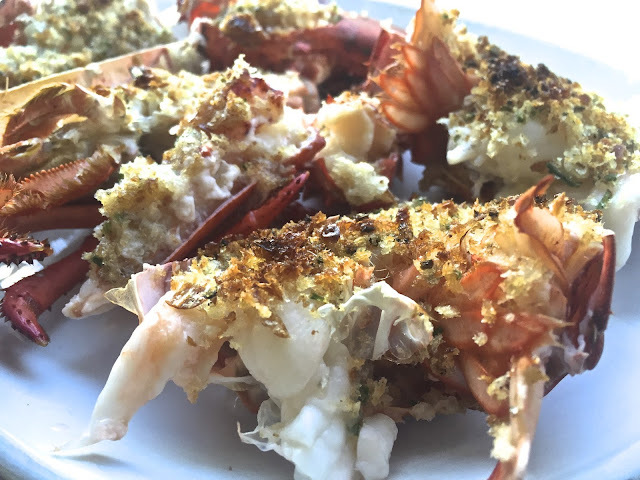 Since we can't enjoy Dong Khanh's salt and pepper lobster, I'll make oven roasted lobsters topped with bread crumbs and sweet butter. Prepping the lobsters takes a bit of time but the result is well worth the effort. Many supermarkets have live lobsters. If you live near an Asian market, live lobsters are usually available along with a variety of other live seafood. One of our local markets, Gelson's, always has a Mother's Day special, marking the lobsters down to $9.99/pound. Gelson's does the same for Father's Day, which avoids partiality. Some markets like Gelson's will clean the lobsters without charge. In which case, you will only have to prep the individuals parts as described below. For this recipe, because the claw shells need to be cut open, smaller lobsters 1 1/2 pounds each are preferred. With a salad and a side vegetable like salt boiled broccoli, that is a beautiful meal. Dessert can be a fresh fruit salad and a nice chocolate eclair. It all depends on what the "mom" in your home loves. The day ahead, the lobsters can be prepped and refrigerated covered with plastic wrap (not aluminum foil) and final cooked in the broiler just before serving. When you bring home the live lobsters, place them in the kitchen sink. Run water on them to cool them off. Do not submerge them in water. They live in salt water and fresh water will kill them. Put 3" water into a large, tall stock pot. Place on stove with the burner on high. Cover. Bring water to a boil. Heat a sauce pan on a medium flame. Add olive oil, season with sea salt and black pepper. Add Italian parsley and mix well. Sauté until lightly browned. Add bread crumbs. Stir together and sauté until lightly browned. Set aside. If the pot is not large enough to handle all the lobsters at once, do them one or two at a time. 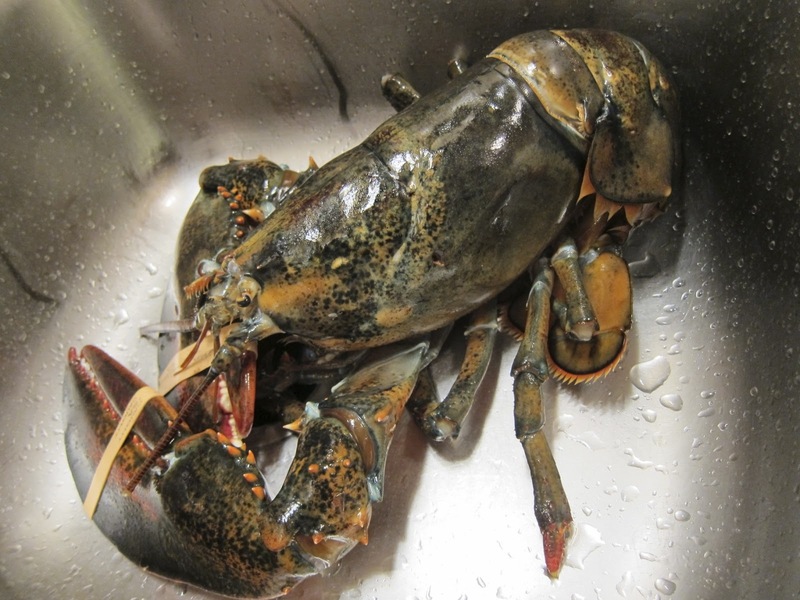 Pick the lobster up by the body and place the head into the boiling water. Hold it there for a minute. Cover and cook 2 minutes. Lift cover. Using tongs lift the lobster up and flip it over in order to submerge the lobster tail into the boiling water. Cover and cook another 3 minutes. Using tongs, transfer the now red lobster to the kitchen sink. Run cold water over the cooked lobster. Continuing cooking the lobsters until all 4 are cooked. If you want to make stock, which is a good thing to do, reserve the cooking water and add the shells after your meal, simmering the shells until the liquid is reduced by half, then strain out the shells and discard. The stock can be reserved in air tight containers and frozen for later use. Using kitchen shears cut off the rubber bands on each of the claws. Working with one lobster at a time, place a lobster into a large bowl. Wear gloves if you want and be careful when you are working with the lobster that you do not cut your hands on the sharp parts of the lobster's body. Twist off each claw at the body. Place them in the bowl. Twist off the tail and the flippers at the of the tail. Place them in the bowl. Place the body with the open side up in the bowl. Using the kitchen shears, cut the lobster tail in half. In the sink, rinse off the tail. Remove the black vein and discard. If you enjoy the savory bits inside the body--which I do--pour them into a bowl. Personally, I discard the black egg sack and reserve the green tomalley, which is delicious. But if you are not into those flavors, simply wash out the body in the sink and run the disposal to get rid of the bits that will be redolent if they linger. Using the kitchen shears, cut the body in half, so there are legs on each side. Continue to wash and clean the half-bodies to remove any residual parts of the egg sack or tomalley. Separate each claw from its sections. Separate each of the sections. Using the kitchen shears, remove half of the shell of each claw. Cut off the top of the shell from each of the sections. Line a baking pan with parchment paper, a Silpat sheet or aluminum foil. Place the tails, claws, sections and bodies onto the prepared baking pan, cut side up. At this point, the prepped lobsters can be covered with plastic wrap (not aluminum foil) and refrigerated to cook the night before or in the morning. 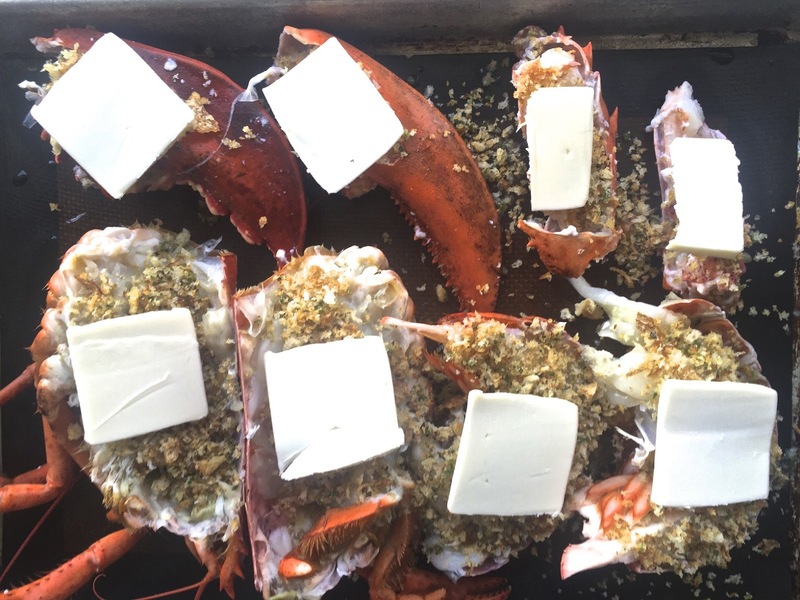 Remove the baking pan of lobsters from the refrigerator an hour before serving. 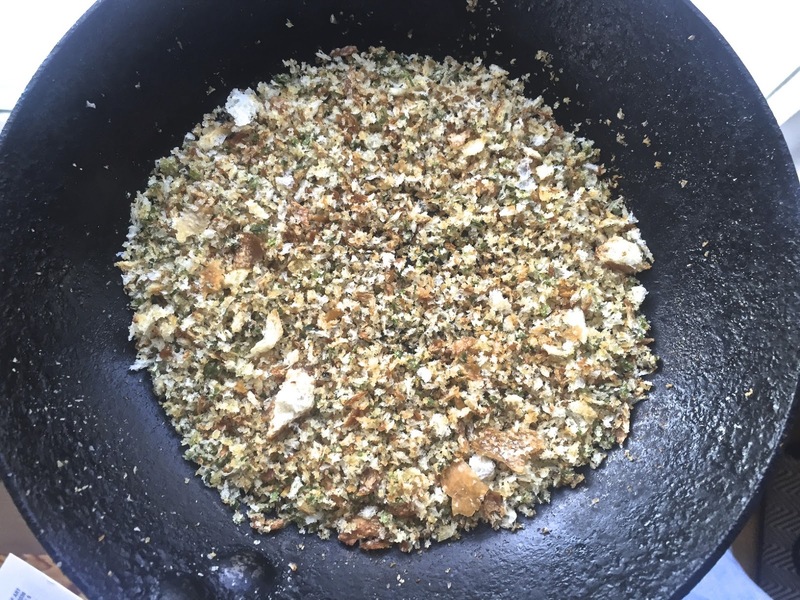 Spoon the seasoned bread crumbs onto the cut sides. Slice 1/8" pieces of sweet butter and place on top of the bread crumbs. Place the baking sheet into the oven. Cook 4-5 minutes, checking to be careful the bread crumbs do not burn. The sweet butter will melt, flavoring the bread crumbs and lobster meat. Serve hot with a salad, side dishes and an ice cold beverage.